1. The fabric is with 280 GSM. , Means the Weight of the Fabric will be 280 Grams per Square Metre. 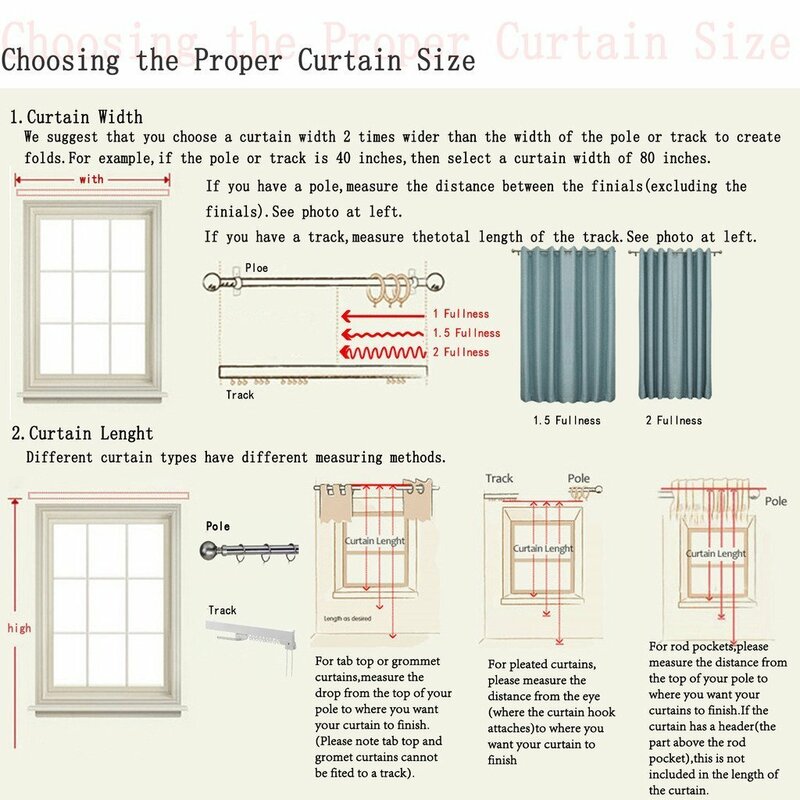 Please Order Extra Curtains from your Total Covering Area to Have more layers in Fall of the Curtains to look Better. 2. Impedes 95-98% of light and UV ray, Save on up to 25% energy costs. Reduce noise levels by 10-20dB, Better for Sound Sleep, Available in 57 Colors Plese Refer Color Chart Image, Disclaimer: Product Colour May Slightly Vary Due to Photographic Lighting Sources or Your Monitor Settings. 3. DESIGN AND STRUCTURE - Include 2 Panels Curtains, an Easy-to-install design featuring both loop and rod pocket style per panel, each with a 1.6-inch inner diameter. BONUS - The back of curtain is of the same material as of front which makes it more elegant to look, and also make it energy efficient. 5. WASHING & MAINTENANCE - Easy care Easy Soil Release. You can use cold water around 30℃ Gently rub and then dry. Made with 3 Layers of Fabric. ✔ 1 Qt contains 2 Panels, Please Select your Desired Color, more colour Options are available in Color Chart. Each Panel Contains 8 Ring Holes. ◆SUNLIGHT CONTROL - Blackout curtains can block up to 99% of light for a sound sleep. These curtains will help those day sleepers to get the relaxation that they need in the darkness that they need. Instead, if you are planning to use them in your living room, they will guarantee that no light comes in to ruin your home theatre movie night. ◆ENERGY EFFICIENT - American-Elm Blackout Curtains help to keep the heat in the room during the winter, and they will reflect heat out of the room during the summer. Both of these will ensure that you are not wasting extra money on heating or cooling that does not need to be spent. You could see a reduction in your electricity bill of up to 15%. ◆MONEY BACK GUARANTEE: Buy with confidence knowing you have a 15-day money back guarantee. You will love your new American-Elm Blackout Energy-Efficient Curtain "SHOP HAPPY"